Y’all! 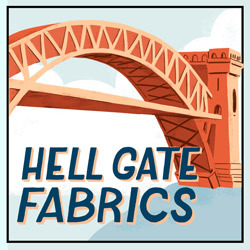 Lest you think the silence on the radio means I’m resting on my laurels, watching reruns of “I Didn’t Know I Was Pregnant”, or just generally loafing about, here’s a post to prove that I’m working away like a good little sewist! As it turns out, the down side of working on multiple projects simultaneously is that you don’t have much to show for your labors. But I’m slowly, surely stitching away and will hopefully have some FO’s for you right quick! First off– let’s chat about the Lonsdale dress, shall we? Little Miss I’m-So-Smart-Why-Don’t-I-Put-In-Bust-Padding is really having lots of fun with that… and by fun I mean, what was I thinking?? I used Sunni’s take on the topic as a jumping-off point. Her post is lovely and explained clearly– the problems arose entirely fom my complete inability to execute things properly. I made the cups out of cotton batting and stitched them to my bodice muslin (after hacking off the straps and a few inches from the top and bottom). I tinkered with the shape, size, and placement of the stupid things for, oh, ages before sewing them in. Then, I decided that they were too high, so rip, rip, rip and away we go– lowered about 2″. Fast forward to me sewing up the bodice with both layers and trying it on again. Suddenly the cups were about 2″ too low. @#$%^*^%!!! I ripped them out and sewed them in once again, and now I’m just crossing my fingers and hoping for the best. Oy. A second bit of unpleasantness with my dear friend Lonsdale is that when I pinned the waistband pieces to the bodice, the waistband came up much shorter than the bodice. Like, half an inch on each side! I checked the waistband pieces against the pattern, and they’re the correct length, so my suspicion is that my seam allowances were wonky. OK, it’s more than a suspicion… you see, on my sewing machine (which has been kindly lent to me by my sister), the seam allowance guide isn’t correct. I recently measured from the needle to the 5/8″ line, and it wasn’t 5/8″! So I tried to compensate by lining up with another spot on the throat plate, but I must have goofed something up. An alternate explanation is that I tried to make a swayback alteration for the first time on this dress (I hadn’t noticed before I got into sewing that my waistlines always sag in the back– yuck! ), and I had a super hard time with it, so maybe I screwed something up there. I decided to set this aside for a bit as it was making me crazy and I’ve had a really long and stressful week at work and haven’t been sleeping well/enough. Me + fatigue + stress + sewing difficulties = I don’t know what exactly, but I’m sure it’s not good! On the Rooibos front, I have accomplished nothing. I don’t even have fabric! I couldn’t find anything suitable that I was really in love with, so I decided to wait and see if I could find something better, but I’ve been working a lot lately and haven’t had time to look for anything. I’m not ready to throw in the towel yet, but there’s a good chance I won’t be able to catch up with the sewalong before the end of August. Oh well– at least I will have lots of helpful posts to look at whenever I get around to sewing it! How cute is this? I love it so much! 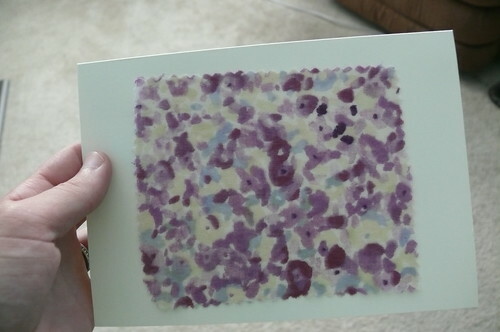 The color and pattern are so cute, and it looks so UNBELIEVABLY professional! It’s lined with fabric featuring little bicycles (with little yellow and purple flowers in some of the bike baskets! 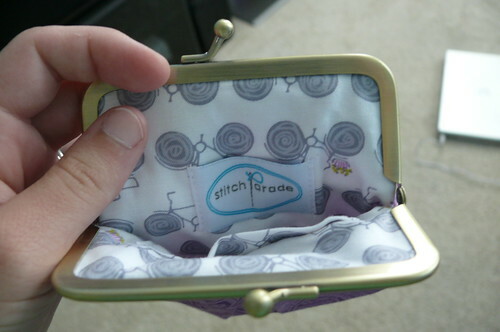 ), and it even has a little “Stitch Parade” tag sewn into it! Every bike should have a basket. And every basket should have flowers in it! 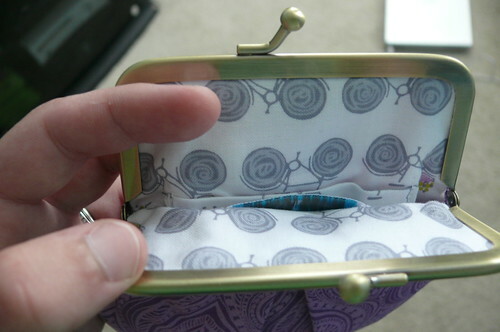 There’s a tiny inner pocket! I can’t believe Andrea made this! She’s so talented! This is some fancy stuff, people. Be jealous! And look! 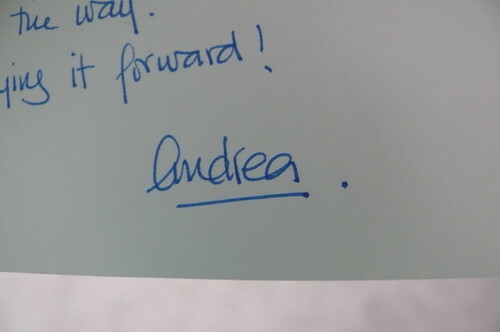 Even her handwriting is adorable! I sent this sample to a lab for analysis, and the report came back saying, "The writer is clearly a mad stitchin' wizard genius. Possibly a princess." In other yay news, Sarai’s announcement of the upcoming Colette Sewing Handbook has me PUMPED UP! I can’t wait for this to come out– I’m turning into quite the Colette junkie and I know that I will learn so much from this! In melodramatic, heart-wrenching news, tomorrow is my last class with Gertie! Nooooooooooo!!!!! Today I’ll be working on my McCall’s 5995 dress in preparation for that. It’s been slow, but I’m happy that I’ve been taking the time to do a good job with that (oh, and my bound buttonholes are done, so everything else seems pretty simple in comparison!) Today’s big task: facings! I’ve had a crazy week at work as well. Sewing came to a standstill, and even Tasia’s baby steps seemed like giant mountains. Even though I have a crazy amount of work to meet my deadline early next week, I made a bit of time to sew last night and was able to finish the Lonsdale. Now, if only I could find the time to write it up before I leave for vacation next week… Good luck with yours, enjoy your last class with Gertie, and don’t worry about the Rooibos. It’ll still be there in the fall! Ooh, you’ll get to take your dress on your vacation! Perfect timing! Hope you guys have a fantastic trip! I’m so excited for the Colette Sewing Handbook as well! And I really can’t wait for their new patterns to come out. Oh my gosh, me neither! Cigarette pants!!!! 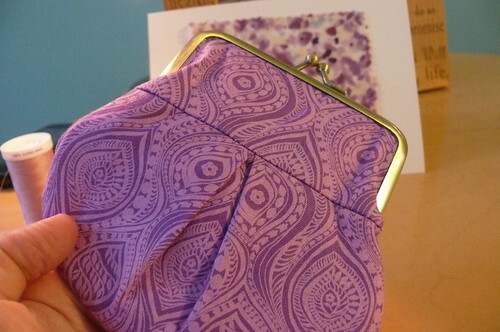 I’m so glad you liked the coin purse – I had fun making it but it’s always good to know that the recipient will enjoy it as well. Sooo… about that seam allowance guide, I find that taping a thin strip of painters tape to mark the allowance I want works wonders. I just tape it on right on the guide, on top of the bobbin plate, makes sense? And if it makes you feel any better, I have bought my fabric for the Rooibos but have not even cracked the pattern open. At least you’ve been working on other projects. Me? I’ve been gallivanting everywhere but in my sewing space!